Best Kitchen Mandoline Slicer – It all started with a stroll down my favorite aisle at Harris Teeter®. There is always something sitting on the shelf in the way of international foods that inspires me to prepare a dish from long ago. I check to make sure they have cans of escargots – check. They also have teeny jars of caviar (hmmm…fish roe) and I can’t help but remember the days when Dad would come home from a trip to Tehran with a bowl sized can of Beluga. But I digress…Those days are relegated to memory. When I turned around, a small section of the opposite wall was covered with an assotment of kitchen gadgets – all on sale. And since it’s high time I begin replacing some of my vintage kitchen tools, I look to see if anything catches my eye. Yes. 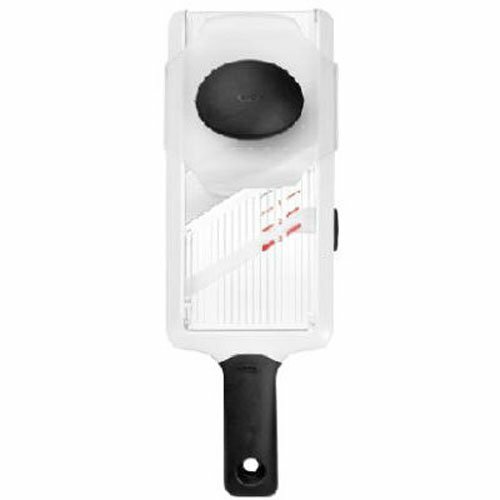 An OXO SoftWorks® hand held mandoline slicer! I was thinking ahead to all the slicing and dicing related to a Thanksgiving side dish. All those little boxes were being checked off in one handheld gadget. However, this model is not going to handle potatoes and the like. That’s when I break out the food processor. But there are 101 uses for handheld slicers with adjustable blades. An impressive list of features for a small kitchen gadget and something I would definitely add to a list of gifts for a new bride or even a seasoned home chef! Everyone is searching for V blade mandolines. I’m not sure as to what make the V shaped blade any more efficient at slicing than an angled blade. They do, however, come in a variety of styles and a wide range of prices – less than $20.00 to close to $70.00 and upwards of $120.00. Some models have more blades (I’m not crazy about the idea of having to switch blade components), some come with containers and others are multi function – as in also being a cheese grater. The top of the line seems to be the Royal Industries model. Can you guess who leads the way in more affordable V blade slicers? OXO® of course with two models: the expensive Good Grips© and the less expensive Good Grips© V blade slicer! and more blades, has me thinking of nicks and cuts. We’re not talking about the occasional cut we all get from wielding kitchen knives and our favorite multi-taking, sharp as a blade, ordinary parer. It’s one of the reasons I bought a mandolin. My thumbs are scarred from the multiple mini cuts inflicted when peeling potatoes and other veggies the old fashioned way. Not to mention the occasional slip of the chef’s knife or my cleaver. So… when you tackle fixed blades or even worse – when you have to switch blade components on a mandolin like this one, I highly recommend you wear a pair of cut resistant gloves. Please, take a minute to reach into that kitchen drawer and wear them while you work. Personally, I do not see the point of having an [popup_product]electric mandoline slicer[/popup_product]. The idea of any slicer is to tackle somewhat more than the normal amount of slicing – particularly if nice even slices are required for even cooking – case in point, my scalloped potatoes or green and red peppers for fajitas. If you have to plug it in, then break out the food processor 🙂 By the way, there is a huge Cuisinart recall so be sure to check your model against the recall list. Customer reviews seem to bear out my point of view. While some find it “lightning quick” and a real time saver, others find that there are so many parts to clean that it is quicker to slice by hand! Bottom line? 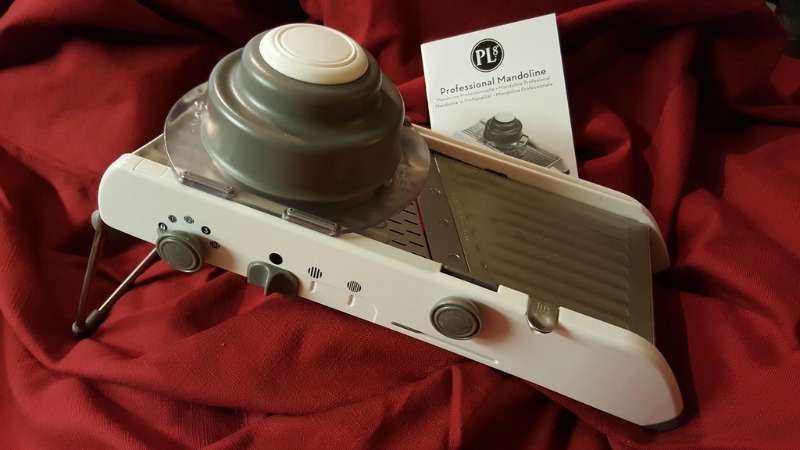 There are not that many different models of electric mandoline slicers to compare or purchase! Lots of slicing to do? Consider a commercial deli slicer but that is definitely reserved for special slicing requirements – meat for example. As I mentioned earlier, the idea here is to have something handy that does not require clearing the kitchen counter and bringing up all the slicing blades, etc, etc. 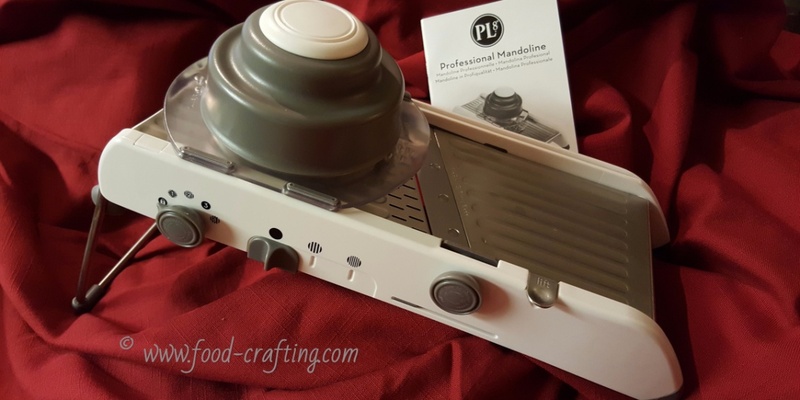 The Progressive International PL8 mandoline is perfect in that I can fold the stand and store in a drawer or on a cabinet pull out drawer. It fits perfectly in a 2 gallong zip lock bag so it is always clean and ready to use. Another neat feature are the non-slip feet and contact point. It makes it easy to keep the slicer steady on a dry counter. I used it for the recipe below and may I add that the onions and potatoes were sliced to perfection in a proverbial New York minute. You would not want your finger to be in the wrong place because the slicing is so smooth and fast, that the damage would be done before you could say ouch! With the exception of potatoes, you could slice all the ingredients for tomorrow’s soup recipe. Line up the bags up on the counter, set on bag holders and off you go. Food preparation made quick and simple. Now that I’ve sliced all that food, I’m going to refrigerate it until ready to use! Here is my recipe for Scalloped potatoes with bacon and onions. 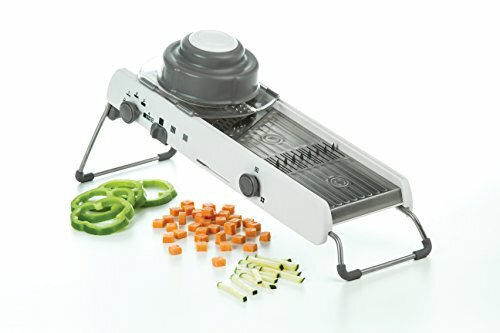 It is the perfect recipe to give your new and best kitchen mandoline slicer a workout!